Our small furry friends feel the cold just as we do, so it’s a sign of care and compassion on our behalf if we consider their needs as well. If you’re not sure which design fits your requirements and their needs best or you just want to make sure you choose the coolest dog vest there is out there, we’ve prepared a list of reviews detailing the features that we find are most useful in these items of dog clothing. If you’re looking for other kinds of items for your canine companion, be sure to check out our other articles such as those we’ve written on quality dog boots, neat-looking dog costumes, or sturdy, yet well-designed dog houses. This model is safe and reliable for walking your pet or performing all sorts of outdoor activities, such as running with them. It can be used regardless the weather conditions, protecting your pet from the wet environment. A reflective strip on the back of the vest will make them conspicuous at night, this way avoiding unfortunate events such as car accidents while also making them easily visible from a distance. Despite being designed for cold weather, this model is suitable for all four seasons, due to the cashmere fabric which makes it warm and comfortable. Even in the summer, your furry friend will feel comfortable and not too hot. An affordable alternative that will provide your pet with a protective exterior layer, this vest comes in various sizes in order to ensure a perfect fit and allow your furry babies to comfortably move around without feeling hindered. The model is covered with a waterproof coating that will keep your dog dry regardless the weather. It can be cleaned in a regular washing machine along other clothes. It also comes in a wide variety of colors to allow the owner to choose the right design that will enhance their pet’s natural features. However, it’s generally recommended for small dog breeds. This model offers three detachable pouches that allow your pet to carry along various items, including everyday use as well as tactical gear. Molles are added on both sides to allow you to attach other accessories when needed. For example, you can store water bottles, food snacks, or even magazines, or whatever you might need to make sure that your pet is comfortable and secure at all times. In order to be stable when worn, this vest has an adjustable webbing. Also, a velcro panel and mesh design on the inside make for better comfort and increased ventilation, all to ensure your dog’s well being. A rather affordable model, this Topple vest features a neck strap that adopts an integrative design, cut from the same fabric. This way you won’t have to worry about tearing or breaking the material. The handle included on this product allows for a perfect grip. It’s different from other models also available and it uses a rubber handle instead of a regular nylon belt. It’s created to fit comfortably into your hand and to be easy to grip in a hurry. The adjustable neck strap can be customized in order to fit the needs of your pet. It is advisable that the customers check the dog’s girth before placing the order. This will prevent any possible misfits. This model is perfect for cold weather, managing to keep your pet warm and comfortable even in the harshest weather conditions. With a classic design, it’s constructed using sturdy, durable yet breathable materials that have many qualities. For example, the exquisite stitching and the excellent craftsmanship make it easy to take off and put on when you want to go for a spontaneous walk out in the park. Also, the exterior layer is waterproof and is excellent for all seasons, protecting against snow or rain as well as coldness. Another feature makes this design an interesting option. The vest is reversible, allowing your pet to wear it on both sides according to his needs. Another reliable alternative, this Gooby vest is lined with fleece and can keep your pet warm even in the coldest season. However, it manages to be comfortable and easy to put on as well as take off due to its ergonomic design. A reflective lining protects the exterior of the material, preventing dirt from outdoor walks from staining the cloth. Also, it catches the light and reflects it, making your pet easy to spot in low visibility situations. With a three-point velcro closure, this model is adaptable and easy to use. The leash can be attached directly to it, making the process more comfortable for both parties. A reliable model constructed using polyester fleece, this Gooby vest features a zip-up closure, making it easy for the owner to dress the pet in a matter of seconds. The zipper is positioned on the back of the vest, so the dog can’t accidentally undress. Also on the back side, there are two D-rings in order for you to attach the leash, meaning that your pet will feel a lot more comfortable since the leash is no longer around their neck. In case you’re wondering about maintenance, you should know that this model can be easily cleaned in a regular washing machine with your other clothing. If you’re looking for a durable yet lightweight model, you should definitely check out this model from A-More, given that it’s made of high-quality polyester and it’s super-light. An adjustable Velcro tape around the waist makes sure that the vest stays on no matter how much your pet moves around or tries to take it off, while still not hindering their movements. Two buckles, again adjustable, allow you to tighten or lose the model as much as you need in order to make sure that your pet to feel comfortable at all times. It is easy to clean and dries pretty quickly. Made using heavy duty materials, this vest manages to be extra-breathable due to the polyester fabric with 3M reflective tape. This is ideal for a reflective model and it will be the only one you need, given its long lifespan due to the durability of the components. 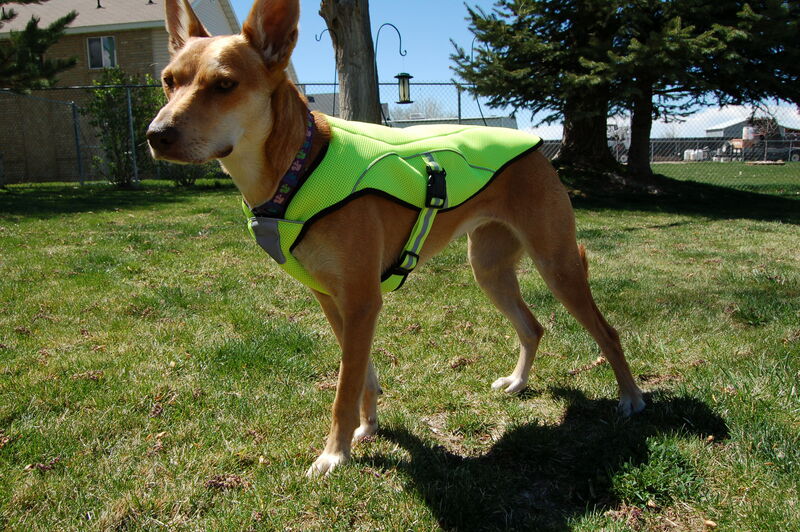 A safety vest as well as a piece of reflective dog gear, this design has multiple functions. It offers high visibility during the day or at nighttime so you can rest assured that your pet won’t be involved in any unfortunate accidents. Adjustable and lightweight, this product features a velcro strap in order to ensure the perfect fit. Easy to take off or put on, this design is also reversible, lined with a warm inner layer that will preserve your pet’s internal heat regardless of the weather conditions outside. There are many sizes available, so make sure to take the proper measurements before ordering. Despite being made of thick material, this vest manages to be lightweight enough not to hinder your dog’s movements. It’s great for all occasions, including outdoor or indoor activities. A Velcro closure around the neck gives the owner the opportunity to quickly dress the pet, without making them feel uncomfortable or encounter difficult behavior. Pet owners do not just purchase clothes for their dogs because they want to play dress-up games with their furry friends. There are all kinds of jackets, vests, and coats on the market that serve very different purposes, and dog owners who want to offer their pets the best TLC available know that getting a few clothing items for their companions is recommended. However, while you may be interested in getting such a piece of clothing for your dog, you may feel at a loss with the huge number of options available for sale. This is where we come to the rescue and offer you some actionable information you can use to make a purchase that will not disappoint you. We focus on a few important aspects so that you can narrow down your search for the best dog vests. Doing your research on the topic can take hours of your precious time, and we want to avoid that. Find all the details you seek in our comprehensive and to the point buying guide. Offer your dog the best care, just as it deserves, and you wish to offer. Discover what aspects are essential and consider them. This way, your dog will enjoy a long happy life by your side. Certain things are more important than others when it comes to selecting dog vests. We want you to be able to make an informed decision, which is why we put together the following buying guide. Some jackets and coats are intended only for taking the dog for a walk when it’s cold outside, and they could use the extra protection. They can be colorful, quirky, and fun, and, as long as they maintain their practical value, by keeping the dog warm enough in chilly weather, they are your best choice. However, if we are talking about dog vests in general, we need to focus on other aspects, too. For instance, reflective vests are used for hunting dogs. Since many people prefer having their dogs with them when they go hunting, such a piece of equipment is mandatory. You don’t want other hunters to end up shooting at your dog instead of prey, by accident. These vests are made from a neon-colored material, which makes a sharp contrast against the environment. If you’re taking your dog to the woods during the hunting season, even if you’re not the one doing the hunting, taking such precautionary measures is highly advised. Also, these vests can prove very useful when you’re walking your dog at night or in other low visibility conditions. A dog vest may also make you more visible to motorists when on a highway, and thus it can prevent accidents. Life jackets are another category we must speak about. Even if dogs are pretty good swimmers, this doesn’t mean that they don’t need some extra support. One thing you should know is that not all dog breeds are the same, and some may not be excellent swimmers. Also, adverse conditions, like inclement weather, can make swimming difficult. The best dog life vests are those made from durable materials. If you want to learn more about various kinds of coats for dogs, let’s talk about cooling vests. These are the most indicated when there is a heat wave, but you still need to walk your dog outside. The best dog cooling vests will ensure that your dog will be comfortable. They can prevent heat strokes, and they are the optimal choice for breeds with dense fur. No matter what kind of vest you need to purchase for your dog, one vital aspect to remember is sizing. Your dog needs the vest to fit, or else the piece of clothing you’ve just purchased will not serve the purpose it was made for. Usually, vests are made to fit the dog’s body, starting with the back of the neck and ending at the base of the tail. The whole point of a vest is to provide proper protection – against heat or cold – for all the vital organs that can be affected by such extreme weather circumstances. One way of determining the right size for your dog’s vest is by measuring the pet across the chest area. The girth here is the largest, and this must get a good fit in a vest. When making dog jackets comparison, don’t forget to take proper measurements first. That will help to get the right model. Also, another aspect to take into consideration is the length of the back. With these two measurements at hand, you cannot do wrong. Some vests come with all sorts of straps for proper adjustments. The type of materials used depends on the purpose the vests must serve. For instance, a vest made to act as a life jacket will need to offer proper buoyancy and to be made from a material that does not retain water. On the other hand, the dog vests reviews provided by pet owners suggest that cooling vests must be made from materials that can absorb moisture and wick quickly. 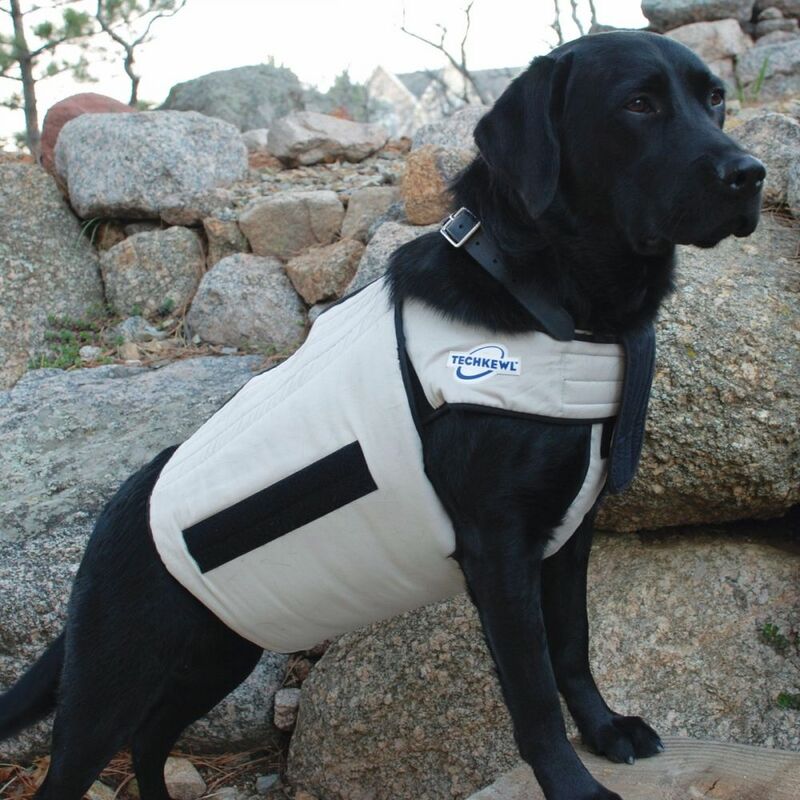 Quilted and padded vests are made from materials that will keep your dog warm. As you can easily see, it all depends on what kind of vest you want to purchase for your dog. Let’s not forget who is going to use the vest after all. Your furry companion needs to have proper support, especially if it is going to wear the vest for extended periods of time. Browse through the new dog coats available, to see what designs catch your eye, but never underestimate your dog’s need for comfort. A good fit, as mentioned, is important, but there are other things to bear in mind, too. For instance, models that come with all sorts of straps should not chafe the animal’s skin. Even dogs with a heavier coat can suffer from extreme rubbing if the straps are made from materials that cut into their skin.